Mongane Wally Serote was born in Sophiatown, Johannesburg on 8 May 1944, just four years before the National Party (NP) came to power in South Africa. His early education took place in the poverty-stricken township of Alexandra and later at Morris Isaacson High – the school in Jabavu, Soweto, which would much later play a significant role in the 1976 uprising against Bantu Education. As Serote’s high school years came to a close, he joined the African National Congress (ANC). He soon became involved with the Black Consciousness Movement (BCM) and was inspired by the poetry that spoke of black identity, resistance and revolt. In 1969 he was arrested and detained for nine months in solitary confinement under the Terrorism Act. In 1972, he published his first collection, Yakhal’inkomo, which went on to win the Ingrid Jonker Prize for debut poetry in English. This early success was followed by a string of highly acclaimed collections throughout the 1970s and 1980s. South Africa during the 1970s was fertile ground for a literary revival of the silenced black voices withering under state repression. This was a defining period for the evolution of political consciousness among black South Africans, and Black Consciousness (BC) affirmed and fostered black cultural values, aiding the establishment of a racial solidarity in the face of harsh oppression. The literature of Serote’s fellow writers Sipho Sepamla, Oswald Mtshali, Chris van Wyk, Mafika Gwala and Don Mattera spurred on the political ideals of anti-apartheid popular movements. Many of these works aimed at mobilising audiences; the immediate impact of drama and poetry drove the momentum for change. Serote was awarded a Fulbright Scholarship and received an MFA from Columbia University in 1979. His poetry that took shape during this period suggests influences from the Harlem Renaissance and Negritude movements, with hints that the writing of Amiri Baraka, Don L. Lee and Ishmael Reed offered him a new mode for expansion and expression. Unable to return to South Africa after completing his studies, Serote remained in voluntary exile, going to Botswana in 1977 where he rejoined the ANC underground and its military wing, uMkhonto weSizwe (MK). Together with the artist Thami Mnyele (whose image of a mother and child graced the cover of Yakhal’inkomo) he was instrumental in establishing the Medu Art Ensemble in Gaborone. His debut novel, To Every Birth Its Blood, (Ravan, 1981) offers a riveting insight into the political activity in the 1970s, exploring the tensions of state violence, black apathy and the shift into violent dissention. Serote’s later novel, Gods of Our Time (Ravan, 1999), outlines the growing militancy of civilians and the gathering intensity of military campaigns that ultimately contributed to the toppling of apartheid. In 1993, his seventh poetry collection, Third World Express (David Phillips, 1992) won the Noma Award for Publishing in Africa. In 2004, he received the Pablo Neruda award from the Chilean government. Serote held a variety of positions in the ANC, returning to South Africa in 1990, when he was appointed Head of the Department of Arts and Culture of the ANC in Johannesburg. He has also served as chair of the parliamentary select committee for arts and culture. 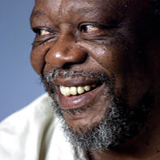 Serote was awarded honorary doctorates from the universities of KwaZulu-Natal and Transkei. Until recently he was a Member of Parliament and Chairman of the Portfolio Committee for Arts, Culture, Language, Science and Technology. Her comment applies equally to the five poems presented in this issue. These works, written in 1975 from the United States while Serote was studying for an MFA at Columbia University, have an eerie resonance that echoes down the years to the present day, speaking to the simmering rage of a still violent society, as they did then. ‘Shadow in Motion: Bra-Zeke Mphahlele’, ‘Heat and Sweat’, ‘For Those of Us Who Make Music’, ‘When Lights Go Out’ and ‘Child of the Song’ are from part two of Behold Mama, Flowers (AD Donker, 1978). The first part of this collection is the epic title poem. In practice, Serote, a deeply spiritual man, is involved in the vital healing the country needs. In his private capacity as a traditional healer – a sangoma – and as CEO of the Freedom Park Trust, he was instrumental in overseeing the construction of the Freedom Park Memorial that opened recently in Pretoria. This visionary monument, built in a stark and beautiful spot, honours the contribution of those comrades who served the struggle for liberation with their lives. Serote’s work as a poet is far from over. Those who love this land and yearn for its reconstruction want honest talk and an integrated vision. In this unstable present, the country is tottering under the compound threats of searing poverty, HIV/AIDS, gender violence, xenophobia, ecological crisis, corruption, and, perhaps the most disturbing of all, the simmering nationalism, internally and on the country’s border in Zimbabwe. Serote’s nation now needs the bold imagination, plain truth, and redemptive inspiration that is born of courageous boundary-breaking language.